Lerici, Tellaro and the whole coast from Bocca di Magra to San Terenzo are a fantastic destination for a kayaking trip. In the eastern portion of Liguria, the Italian Riviera, here you can find the last cliffs, caves and rocky pinnacles before the plain beaches of Tuscany. Here below you can find a map of this part of Ligurian coast and a description of the kayaking itinerary. A tip on how to visit this stretch of Ligurian coast: inflatable kayaks are a very good solution as well. Please notice that the distances on the map are straight lines, but it is normal (actually, very recommended) to follow by kayak all the little bays and imposing rocks of the Ligurian coast. This kayak itinerary starts from the mouth of a river, the Magra, then along the cliffs and beaches of Monte Marcello, Fiascherino, Tellaro and Lerici. Of course you can also paddle in the opposite direction, but this is the solution we recommend. There are two reasons: a) it's much easier to park the car near the Magra than on the sea and b) this way it is a climax of landscapes as they get more and more beautiful; moreover, if you conclude your trip in San Terenzo or Lerici, you can have a last swim and also a panoramic beer. The departure from the river is fascinating mostly because the environment is different from what you see during the common kayak trip: the Apuan Alps in the background, some reeds and many boats (the mouth of the Magra is a river port). After reaching the mouth of the rived we continued kayaking to Punta Corvo, along steep walls covered by rich vegetation. Behind us, the view of the rocks lapped by clear water and the Apuan Alps in the background was definitely worthwhile. Under Monte Marcello there are some wide open beaches, some of them accessible only by sea, others by steep trails that depart from the road at the top of the promontory. Needless to say that kayaking is the best way to get there! But I say it anyway. A kayak allows discovering hidden coves, caves and ravines. While approaching Tellaro the beauty of the coast is matched by the charm of the houses perched above the sea. So, the village of Tellaro doesn't detract anything from the glory of the nature, indeed it adds to it. The only downside of this stretch of coast is the number of motorboats on summer weekends. We moored the kayak in the tiny harbor of Tellaro and we briefly visited the town. Then we resumed paddling and the coast got even more surprising. After Tellaro the coastline becomes extremely rugged and there are some remarkable caves, as well as cliffs and rocky coves surrounded by lush vegetation. This fantastic stretch of coast ends in Lerici (but the central square and the castle of Lerici itself are beautiful as well, of course). Then you can continue to paddle to San Terenzo, where you can moor the kayak (at the beach or in the marina) and conclude the trip. At this point you can go back by canoe or find some other way to retrieve the car. Following the true Wild Trips spirit, you must be very curious and epicurean during your kayaking trips, you have probably lost a lot of time and energy between beaches, bays and coves. In this case you can get a bus, which is very frequent, from San Terenzo to Romito Magra. From here to Ameglia (or Bocca di Magra) there is another bus, but it does not run on holidays, so you might have to walk or hitchhike. Another option is to be proactive and start your kayaking trip upstream of Ameglia, precisely in Romito Magra that is so easily accessible by bus from Lerici and San Terenzo. This adds a stretch of river which is not particularly interesting, but still enjoyable (in theory there should be enough water!). Anyway, while someone retrieves the car the other paddlers can wash the kayaks and enjoy San Terenzo and the view of Lerici, sipping a beer. It is a very good idea to spend more days in the area, so you could look for the most convenient places where to sleep here. Click here for more kayaking trips, and info about kayak rental, tours and prices. You can follow directly this link to access the webpage about the kayaking itinerary around Portofino (including Camogli, San Fruttuoso, Santa Margherita) and here for the trip from Chiavari to Levanto (visiting also Sestri Levante, Moneglia, Framura). 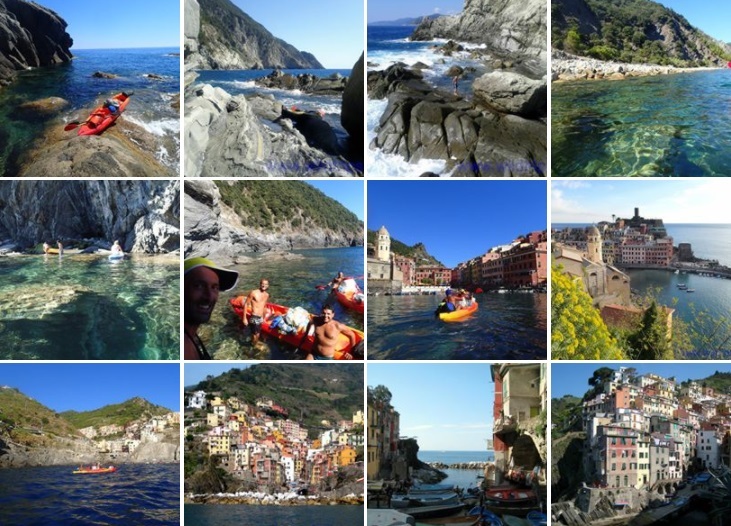 It's amazing to visit Liguria by kayak, but there are other deserving destinations, of course. For example, you might kayak the Ardeche river, in a canyon in the south of France.